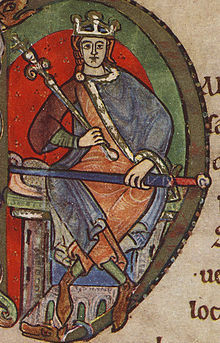 Malcolm IV (Mediaeval Gaelic: Máel Coluim mac Eanric; Modern Gaelic: Maol Chaluim mac Eanraig), nicknamed Virgo, "the Maiden" (between 23 April and 24 May 1141 – 9 December 1165) was King of Scotland from 1153 until his death. He was the eldest son of Henry, Earl of Huntingdon and Northumbria (died 1152) and Ada de Warenne. The original Malcolm Canmore, a name now associated with his great-grandfather Malcolm III (Máel Coluim mac Donnchada), he succeeded his grandfather David I, and shared David's Anglo-Norman tastes. The Orkneyinga Saga claims "William the Noble", son of William fitz Duncan, was the man whom "every Scotsman wanted for his king". As William fitz Duncan married Alice de Rumilly c.1137, young William could only have been a youth, perhaps a child, by 1153. There is no evidence to suggest that William ever made any claims to the throne, and he died young, in the early 1160s, leaving his sizable estates to his three sisters. Of William Fitz Duncan's other sons, Bishop Wimund had already been blinded, emasculated and imprisoned at Byland Abbey before King David's death, but Domnall mac Uilleim, first of the Meic Uilleim, had considerable support in the former mormaerdom of Moray. Another contender, imprisoned at Roxburgh since about 1130, was Máel Coluim mac Alaxandair, an illegitimate son of Alexander I. Máel Coluim's sons were free men in 1153. They could be expected to contest the succession, and did so. As a new and young king, Malcolm also faced threats to his rule from his neighbours. Foremost among them were Somerled, King of Argyll; Fergus, Lord of Galloway; and Henry II, King of England. Only Rognvald Kali Kolsson, Earl of Orkney, was otherwise occupied (on a crusade), and his death in 1158 brought the young and ambitious Harald Maddadsson to power in Orkney, who proved yet another threat to the young Malcolm. The first open opposition to Malcolm came in November 1153, from family rivals, the sons of Máel Coluim mac Alaxandair. They mounted their challenge with the aid of a neighbour, Somerled of Argyll. This threat soon dissipated, because Somerled was beset with more pressing concerns: his war with Guðrøðr Óláfsson, King of the Isles lasted until 1156 and a possible conflict with Gille Críst, Mormaer of Menteith, over Cowal, loomed large. Support for the sons of Máel Coluim mac Alaxandair may also have come from areas closer to the core of the kingdom; two conspirators are named by chroniclers, one of whom died in trial by combat in February 1154. [R]emoved [the men of Moray] from the land of their birth, as of old Nebuchadnezzar, king of Babylon, had dealt with the Jews, and scattered them throughout the other districts of Scotland, both beyond the [Mounth] and this side thereof, so that not even one native of that land abode there. In 1160, a marriage between Malcolm and Constance of Penthièvre was considered. Constance's brother Conan IV of Brittany had married Malcolm's sister Margaret earlier the same year. However, Constance refused to marry the Scottish king, hoping to wed the French king Louis VII instead, but Louis married Adèle of Champagne. According to legend, he had a daughter who was betrothed to Henry, Prince of Capua, on the latter's deathbed, but this is said to be false as Malcolm had no heirs. However, since illegitimacy did not apply to medieval females, but it was often pretended that it did, she may have been overlooked. Malcolm's mother had formulated a plan for a marriage to Constance, daughter of Conan III, Duke of Brittany, but Malcolm died before the wedding could be celebrated. This does not mean that Malcolm could not have had a concubine, or mistress. ^ a b Barrow, G. W. S. "David I". Oxford Dictionary of National Biography (online ed.). Oxford University Press. doi:10.1093/ref:odnb/7208. ^ Lauder-Frost, Gregory M.S., FSA Scot.,"Agatha - The Ancestry Dispute" in The Scottish Genealogist, Edinburgh, Sept 2002, vol.xlix no. 3, pp. 71–2. ^ Hunt, William (1899). "Waltheof (d.1076)" . In Lee, Sidney. Dictionary of National Biography. 59. London: Smith, Elder & Co.
^ Peters, Edward, ed. (1971). The First Crusade. Philadelphia: University of Pennsylvania Press. p. 35. ISBN 0812210174. ^ Suger, The Deeds of Louis the Fat, transl. Richard C. Cusimano and John Moorhead, (Catholic University of America Press, 1992), 191–192 note19.